...and their numbers are growing every year. There simply aren’t enough services to support caregivers in their compassionate quest to care for others while desperately trying to find some balance in their own lives. “Now More Than Ever,” is this year’s theme for National Family Caregivers Month. It couldn't be more appropriate. In 1994, The National Family Caregivers Association (now called The Caregiver Action Network) initiated this annual honor by creating National Family Caregivers Week. In 1997, President Clinton signed the first official proclamation, and every president since has followed suit by issuing an annual proclamation celebrating family caregivers. 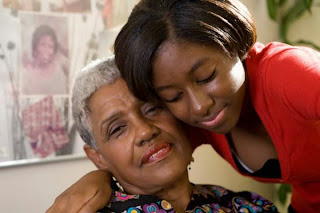 Eventually, National Family Caregivers Week became National Family Caregivers Month. Tell a caregiver that you appreciate what they do in the name of caregiving. Offer to spend time with a friend or loved one so that their caregiver can get a little break. Even a few hours a week can make a world of difference in a caregiver’s well-being and happiness. If the caregiver you know appreciates prayers, pray for them, and let the person know you did. Offer a listening ear. Sometimes caregivers feel they have no one to talk to. Even though you may not completely understand what it’s like, listening with concern is often enough. What else? I know there are readers out there with even better ideas. How do I know this? Because caregivers read this blog, and they are some of the most creative people I know. Feel free to share your ideas in the comments section. I'd love to hear your ideas.